Sucrose is a disaccharide consisting of a mixture of monosaccharides glucose and fructose. 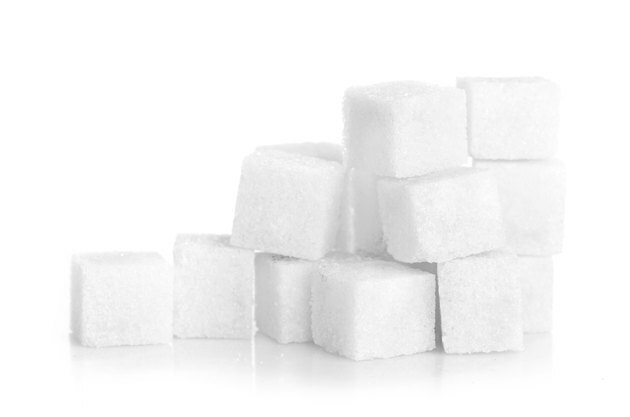 In its most common form, sucrose is easily recognizable as table sugar. As with most other forms of sugar, you should consume sucrose in moderation, if at all. According to the American Council on Exercise, the over-consumption of sucrose may carry some serious health risks. Due to its simple chemical composition, sucrose is digested quickly. A serving of food rich in sucrose can cause a sharp increase in blood sugar that is often followed by a sharp decrease. The sudden rise and fall in blood sugar often affects mood, causing sudden bouts of irritability and fatigue. A balanced meal consisting of protein and complex carbohydrates is digested slowly. Calories are burned at about the same rate they are released into the bloodstream as glucose. Sucrose, due to its simple molecular structure, is digested quickly, releasing glucose into the blood faster than it can be burned. Glucose not used for energy is stored as fat. Sucrose can also trigger strong sweet cravings, causing you to eat more than you intend to. When your blood glucose rises suddenly, such as in the case of a sucrose rich meal, a large amount of insulin is produced to shuttle the glucose to muscle cells where it can be burned. Over time, chronically high insulin can result in the wearing out of insulin receptors, causing chronically high blood glucose. The Mayo Clinic warns that over time, this condition can deteriorate into type 2 diabetes. Sucrose, if allowed to remain on your teeth, provides an environment for bacteria to grow. As the bacteria feed on the sugar, acid is produced as a waste. This acid can eventually eat away at tooth enamel, leading to decay and tooth loss.